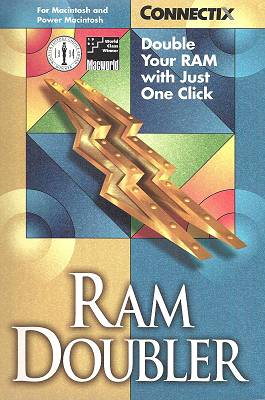 During the early to mid 90s, an odd kind of software tool emerged - the so-called "Ram Doublers". These programs made dubious claims that they would make your system effectively behave as if it had more RAM. RAM prices were constantly dropping, yet software RAM requirements were constantly increasing, RAM was still not really cheap, and not all computers were easily upgradable. There were already numerous other system speed-up and enhancement software tools on the market, such as DOS memory managers, disk caching products, disk optimizers, or disk compression. So why not software that somehow increases RAM in Windows? The four most popular appeared to be: Connectix RAMDoubler, Syncronys SoftRAM, Quarterdeck MagnaRAM, and Helix Hurricane (Winworld does not have this one yet). Was there any truth to this? Well, yes, some. But how? Most of the tricks simply addressed Windows 3.1's memory management shortcomings. During the development of Windows 3.0 and Windows 2.x/386 certain design decisions were made that were no longer optimal. The 3.x memory management was nowhere nearly as advanced as NT or Unix, and had to maintain compatibility with DOS and earlier Windows. 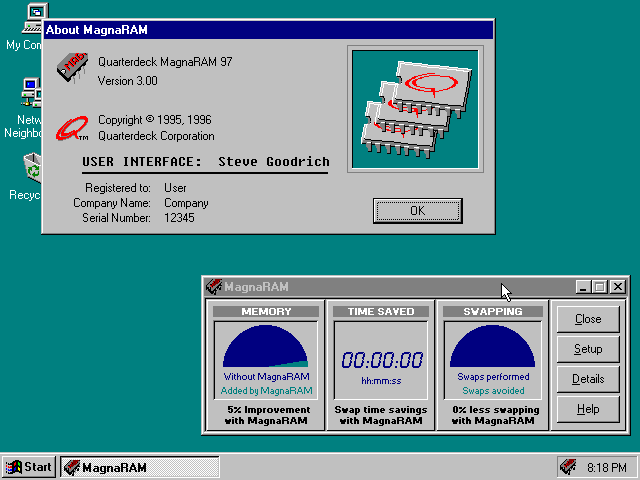 Limits in internal GDI resources often prevented multiple Windows 3.x applications from running at the same time, even if there was plenty of RAM. Tricks to reclaim or stretch these resources would let more programs run. Windows 3.1 still loaded parts of drivers, DLLs, and applications in to 640k base memory just like Windows 1. When this fills up, no more programs can load. 3.1 can't avoid this, but some optimizations could improve the way this memory is used. Hard drives were still slow and small, while programs sometimes allocated large amounts of empty memory. Swapping such memory to disk could be very slow. Lightweight data compression could eliminate large empty areas and vastly speed up writing swap. Further speed improvements could be seen if information about these empty areas were, itself, kept in a small amount of non-swappable RAM. Generalized Windows algorithms regarding what should stay in memory, where things should be loaded, or what/when things should be swapped out could be improved. Various default Windows settings such as PageFileOverCommit= were no longer sufficient for newer applications, and could be tweaked. The big caveat that should be obvious to any technical minded person, is that any speed or memory increase would be completely dependent on the specific applications, tasks, and configuration. A program that needs to load and process 8MB of actual data will not be any happier if there is only 4MB of real RAM. At best you might be able to load some extra instances of Microsoft PowerPoint or Excel. Further, it should have been fairly clear that such tools would be short lived. Microsoft implemented some similar optimizations directly in to Windows 95, and most of these issues were not at all applicable to Windows NT. On top of that, RAM continued to get cheaper, and hard drives got faster. Never the less, these software tools sold in large quantities. Since everything these programs were supposed to do was under the hood, there was no easy way for normal users to gauge their effectiveness. Things only started to go south when experts began discovering some of these applications did absolutely NOTHING. Specifically, Syncronys SoftRAM 95 was proven to be completely broken, ineffective, and even contained bogus blocks of code. It was nothing more than a placebo product. This opened them up to a bunch of lawsuits. Ah, the days when people actually expected software to do something useful! Syncronys still continued to claim that at least their Windows 3.1 version "worked". At any rate, this kind of fudging really soured the market for this kind of product, although similar tools did continue on for a little while. Reportedly Helix Software's Hurricane 2.0 for Windows 95 (later McAfee Hurricane 98) delivered on most of the memory compression promises and even added an interesting trick of making use of unused video RAM. And people still complain that 4 GIGABYTES of RAM is not enough! I think I found Hurricane 98 on a crazybytes (or twilight) warez CD on archive.org once. I think I'll install softram95 on my win2k machine, to double the RAM to 4 GB, then install the three others. Using my simple (but accurate as tested by the county's top high school's graders) math, I should have 32 GB of DDR2 RAM in my IBM ThinkPad T60, ignoring the fact the chipset only supports 3 GB physical RAM and force me to upgrade to win2k datacenter to take full advantage of it. I'm surprised it even bothers to give an error. Notice the UI program is still giving the same nonsence numbers. Yeah the physical RAM is always stuck at 32 MB, but the "virtual memory" kept changing every time I ran it (~250 MB or ~600 MB). I got the option dialog to pop up once but disappeared after clicking "OK" on the entry point error (which kept reappearing). Sadly people still haven't learned about snake-oil. Almost everyone has such bullsh*t-apps on their phones and think it would speed up the system if they press on a button every 30 minutes. There were not only snake-oil RAM enhancers, the were even snake oil memory chips! There is no picture of the chips I am talking about and I cant find one right now. But it is described there. The ones I have are just black plastik rectangles with pins and labeled with "WRITE BACK" - nothing more. 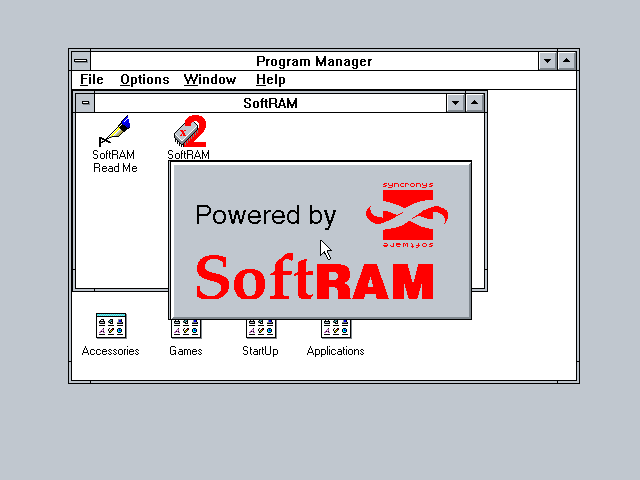 Did the Windows 3.1 version of SoftRAM actually work? Or was it also broken? I definitely remember these utilities and I even used one of them (Helix Hurricane) for a certain period on an old PC of mine (which I still have), an old (and really rare) Total Peripherals AM386DX-40 computer that was running Windows 3.1, and it has this really odd item in the Control Panel called "Hurricane Control Center". It also included a system information utility (similar to/along the lines of Quarterdeck's Manifest) which you could also use to examine information about the PC that it happened to be running on (surprisingly it even correctly identified the CPU as an AMD AM386DX-40 at 40 MHz). I have a number of computer magazine issues which also loaded up some of these programs, namely the January 1996 issue of PC Novice as well as the January 1996 and April 1997 issues of PC World. Generally speaking though, these utilities appeared to have the most effect under Windows 3.1 or Windows for Workgroups rather than Windows 95, and under both environments, the utilities making the fewest claims were the ones (ironically enough) with the most improvements. My opinion though is that these utilities were simply just overrated and that for all that you could spend some (good) money on these programs, in most cases it was simply just better to spend that same money on real RAM. Some did have uses correcting for limitations in the system memory allocation. For example, MultiFinder gives each program a complete block of memory even if most won't be used. RAM Doubler Mac would compress the unused memory and therefore free it for other applications. Similar techniques could be useful for Topview, DESQview, and virtual DOS machines in Windows. http://www.ambrosiasw.com/ambrosia_times/january_96/3.1HowTo.html explains the Mac version in more detail. The worst part is these days nobody even blinks an eye when presented with scam software (or hardware or service). If softram were a commercial product today, nobody would bother to call it out for what it is. Just yet another scam from a big name company.